Appearance: Light tan with cream colored markings. She has long, loose, wavy hair. Clothes: Crystal sometimes wears a tribal outfit, but every now and then wears a regular blouse and trousers. It can vary, because she likes to pick and choose things from different vendors whenever she visits towns. She wears an eyepatch over her right eye. Strength: Long range shots, swift. Weaknesses: Not physically strong, blind in one eye. Weapons: Crystal uses bows and arrows. Only occasionally will she use a dagger that she keeps. Crystal Navarro was raised by her single father. Both worked as merchants together, but Crystal soon came to terms that it wasn’t enough to support her poor father and his deteriorating health. She traveled the islands in search of new work, eventually joining merchant ships, despite her father’s approval. While she was gone overseas, her father passed away. She regretted leaving him behind in the first place, so she returned to selling and farming in his honor. Finances didn’t improve, and she missed the short-lived life on the sea, so she decided to return. Aboard another merchant vessel, she met a few others and established friendships to prevent regret of losing her father. 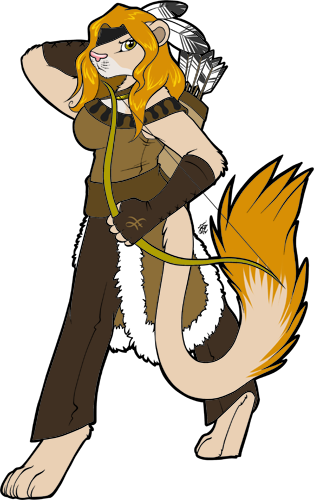 Eventually, they learned that Lucas Ybrad was hiring with good pay, so she and a few others left the ship to join The Hunters on Mangora.